The genre of the (truly) funny slapstick cartoon, in which characters make smart-alecky asides to the audience and anything can happen and usually does traces its origin back to one individual, one driven perfectionist and no, I’m not referring to Uncle Walt. Avery supervised a unit of younger animators, including Chuck Jones and Bob Clampett at Warner Brothers from 1935 to 1942. With his little team in a backlot wooden bungalow they christened Termite Terrace, he dreamed up Daffy Duck and Porky Pig, and helped to finesse the personality of Bugs Bunny, who rivals (ok, some say stomps) Mickey Mouse as the greatest cartoon character of all time. The 140 animated shorts he made in his career with Walter Lantz, the Schlesinger studio at Warner Bros. and MGM are distinguised (is that the right word?) by their exaggeration and nonstop gag piling, frantic speed and a world weary sarcasm leavened by pre-school playground exuberance. 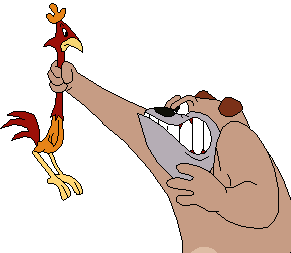 What shaped and colored Avery’s anti-Disney animation style? Growing up in Texas, I believe! Those early formative years in a rural farming culture of Texas tall tales and folklore, racial segregation and the poor Southerner’s suspicion of banks, big capitalism, Madison Avenue consumerism and other variants of Northern authority pushing in. Warner Brothers contrived the names Looney Tunes and Merry Melodies to go head to head with Walt Disney’s Silly Symphonies series of music-based shorts. The Looney Tunes won out. 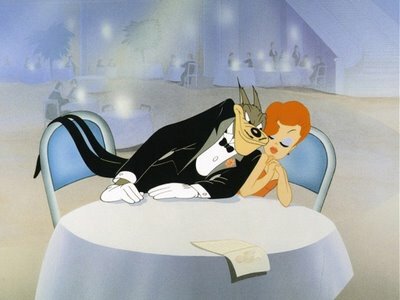 They remained the favorite pre-movie cartoons up until theaters discontinued the practice in the 1960s. Curator of film for the Museum of Modern Art in New York Charles Silver posts some interesting scholarly notes on Hollywood animation from 1944-1959 that include Avery and some of the other animators mentioned here. Steve Connor is an abstract fine arts painter, former art director, Adobe CS-6 certified instructor and CEO of Deep4D Digital Media & Training. He demystifies the PS tools and the difference modes of drawing and painting with them in this free 90 minute workshop, Vector and Paint: An Intro to Photoshop. Caldecott honor-winning illustrator E.B. Lewis will keynote the conference, Kick It Up a Notch and teach an illustrators’ intensive workshop on Sunday after Saturday’s main event. Below Lewis speaks compassionately on his exhibit of fine art paintings Lotto Icons, which began as scribbles in his sketchbook. There’s still time to sign up for Kick It Up a Notch here. 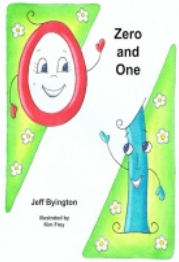 Folk artist Kim Frey and author Jeff Byington discussed their collaboration on Jeff’s picture book Zero and One on a “Marks and Splashes” webinar the other night. 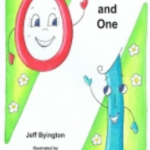 They shared how the story evolved from scribbled pencil thumbnails to a paper and print book on Amazon CreateSpace, e-Books on both the Kindle and Nook platforms and even a YouTube book trailer. You can watch the recording of our visit with them here. 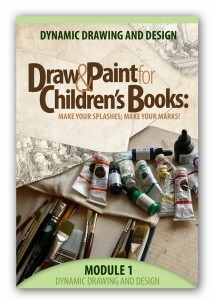 Author-illustrator Mark Mitchell, who teaches lessons in the “Marks and Splashes” course wrote this post. Get on Mark’s blog mailing list and see his short videos on “the secret” to good drawing.